The models in this folder were designed for a course on the Copernican Revolution. In this course students explore the history of astronomy from the Ancient Greeks to Isaac Newton. Astronomical theories are studied in some detail and evaluated based on their success or failure at reproducing astronomical observations. The EJS simulations in this folder allow students to actively engage with the astronomical theories and visualize the apparent motions predicted by each theory. For more information on these curricular materials please visit http://facultyweb.berry.edu/ttimberlake/copernican/. Helps students visualize simplified and full versions of Copernicus' planetary theory. 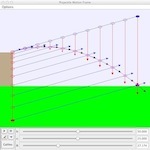 Helps students visualize simplified and full versions of Ptolemy's theory for superior planets (Mars, Jupiter, Saturn). Helps students visualize simplified and full versions of Ptolemy's theory for inferior planets (Mercury and Venus). This virtual celestial globe does what a physical celestial globe does and much more. You can set the time of day, time of year, and latitude of the observer to determine which stars are visible and where the sun will appear just like in a physical celestial globe. But this virtual globe also allows you to animate the apparent motion of sun and stars, view a dynamic "star chart", change the eccentricity of Earth's orbit and the tilt of Earth's rotational axis, and adjust the year to see the effects of the precession of the equinoxes. 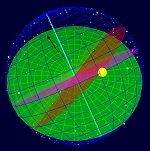 This model simulates the shadow cast by a gnomon at any time of day, on any day of the year, at any latitude on Earth. The model also provides a 3D view of the observer's horizon plane on a spherical Earth and animates the motion of Earth around Sun (or, optionally, the motion of Sun around Earth). Helps students visualize how the observed phase of Venus is connected to the relative locations of Venus, Earth, and Sun. 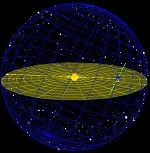 The model allows the user to move Venus around in its orbit (in either the Copernican or Ptolemaic system) and displays the predicted phase. In addition, Galileo's drawings of Venus can be shown to compare with the predicted phases for each system. Helps students see how the observed phase of Moon is connected to the relative locations of Moon, Earth, and Sun. The model also illustrates the "Earthlight" effect (that the dark part of Moon is slightly brighter near the New phase because Moon receives light reflected from Earth).